Oak - Beech / Heath Forest on a steep hillside, featuring mountain laurel. A thin veneer of soil covers steeply sloping bedrock in the Oak – Beech / Heath Forest. The soil is mineral soil , meaning it’s composed primarily of particles of weathered rock ( sand , silt , and clay ) rather than decomposed leaf or animal matter. It’s also acidic , due both to the parent rock , and to the fact that rainwater running over the slopes leaches away basic elements such as calcium and magnesium. The acidity makes the soil relatively infertile . Although excess rainwater drains off rapidly, some moisture is retained by duff (decaying leaves and organic matter ) on top of the soil, and patches of moss. The nearby stream keeps air moist. 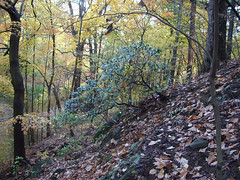 This natural community is most common on northwest facing slopes at Rock Creek Park, though it can be found on some northeast facing slopes as well. Map tip: To see the lay of the land, go to the interactive map of Rock Creek Park and zoom out until you can see the whole park. In the Layers/Legend panel, change the basemap to NPS Relief. Play with the Transparency slider bar at the top of Layers On/Off. You can also zoom to about 1:36,112 and turn on Contour Lines (in Layers/Legend panel under Layers On/Off).